My worst fears have been realized about not being able to connect to FB, or Twitter I was told this morning that China is blocking social networking sites here in Chengdu, perhaps all of the country. Apparently this started about three months ago. Our FB friends can communicate with us directly by posting a comment at the bottom of the blog, just as if it were FB. So far we are able to post on our own site, but we will be careful with words. We will still post still photos, and narratives of our travels. And Lucky will still be able to do his blog! What a day. 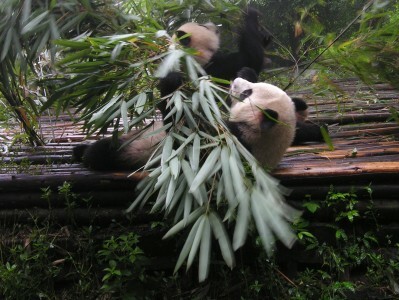 My cousin pandas are big, even the babies are big, and they are always eating something called bamboo. I hear my friends P-bear, Foster and Lai Lai talk about it, but they don’t eat either. The Chinese people are proud of their pandas. There were lots of Chinese there making flashes with little cameras and getting into the pictures. I got into Bob and Claire’s pictures too. I think I’m prettier than those pandas. The old ones just laid on their backs and ate bamboo, but the young ones wrestled and pretended to bite and rolled around. One even slept in a tree. I guess they really are bears. Claire liked the babies best. I’m jealous. She coooed over me, but nothing like she did with the baby pandas! We even got to watch the bottom end of the baby feeding process. Evidently, baby pandas need lots of help with keeping their stuffing moving through and nurses are on constant display stroking tiny panda butts (theirs didn’t have tags that said Made in China). 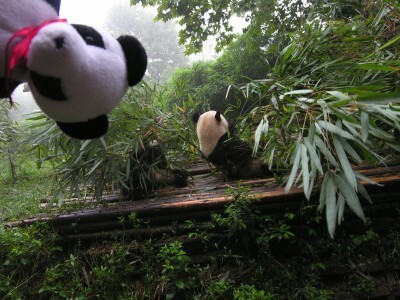 Bob and Claire cheered for that panda when he finally finished. Claire: It was really fun to see so many pandas and yes, the tiny ones were really adorable, but the cubs, up to a year and a half were more fun to watch. In slow motion, they loll and wobble and tumble and wrestle. They gum, and paw and flop and blink and yawn. Every move they make is absolute innocence and honesty. With the adults needing most of their day just to feed, I don’t understand why the little ones, who are growing so fast, aren’t constantly hungry and lean. Their diet must be very rich. The rest of our day was fun too. We rode into the center of Chengdu to meet with Peter Snow-Cao of Bike China Adventures http://www.bikechina.com/index.php. He was able to offer lots of very helpful advice about our route: he confirmed that it will be grueling. On the way home, we got lost three times, it was great. Bob: Now I know why we get lost so much; Claire likes it. Hmmmm. Claire shot another video as we wove through traffic on our way home. Per the above problems, it will be awhile before you see it, but worth the wait. Most of the people we ride with in Tucson will know that I prefer hills to flat traffic rides, but that I have a fair amount of testosterone for an old guy. Well, there is something about Chinese traffic, chaotic, crazy, dangerous, that brings out the old mountain bike racing instincts and skills from twenty years ago. I get into a zone and we merge with the throngs. I absorb the pattern of traffic flow, read “body language” and know when to challenge the cabbie, and when to track stand and let him pass. It is thrilling and calming at the same time, and I can’t get enough of it. I could do without the deepening cough I get from the horribly polluted air, but it will only be a few more days before serious elevations will have me wishing for air of any kind, polluted or not. Peter says our, now generally set, route through Tibetan cultural area (better than Lhasa he opines) will reach elevations of 15,333 feet at least. Yikes. Tonight we tried another of the family fandians in our local hutong, and had even more fun than before. This time Claire took photocopies of food pages from a travel guide so we would have some idea of what we were ordering. We ordered fish and green beans and eping pejo (they are big and we share) When the fish dish came it was huge and loaded with all the things I love, garlic, chillies and ginger, also tiny bones and the head and tail. The strange head meat (brains?) was tasty. When the green beans came they were peas. Oh well, 50% isn’t bad. Everything was delicious. There was a general loud banter between the staff, regulars and the lao wai (foreigners). Everything we did was watched with general approval of our eating style. One other diner loudly proclaimed that Claire was very good with chopsticks, and better than me. True. Life is not easy for most Chinese, the average wage here is about 10 kwai ($1.46) PER DAY. Our expensive, for them, dinner this night, because of the protein, was about $6. We made their day. Our average daily expenses so far in China, $29 including the panda tour and special van from the airport. Travel doesn’t have to be expensive to be fun.